Counting no worse than second places World Champions Billy Besson and Marie Riou lead the overall standings after five races at the Nacra 17 European Championships at La Grande Motte as the fleet split into a 40 strong Gold fleet and 31 Silver fleet. Two further races were sailed in very variable, shifty offshore and cross offshore winds which rose and fell between 5 and 25kts. Besson and Riou were the most consistent in the fleet posting two secure second places, matched for best aggregate tally for the day by Australian cousins Jason Waterhouse and Lisa Darman who scored 1,3 to qualify in fourth, just ahead of compatriots Euan McNicol and Lucinda Whitty and Spain’s Iker Martinez and Tara Pachecho. To try and beat the forecasted strong Mistral winds the racing schedule was advanced by two hours, but the efforts proved largely in vain as the winds initially were too strong. But – contrary to the expected trend – the breezes died away enough to allow two difficult races to be contested for both qualifying fleets. The crews were kept guessing some of the time, with big changes in wind direction from leg to leg, especially later in the day. The veering wind became harder to read as it came more off the shore, making consistency elusive. Waterhouse and Dalman, past ISAF Youth Worlds champions and Hobie 16 Youth world champions, won the first race of the day, leading from the windward mark and staying ahead of Besson and Riou with Darren Bundock and Nina Curtis third. In the other fleet Franck Cammas and Sophie De Turckheim won their first race here, sailing better in the tactical, shifty conditions than they did on their opening day, Tuesday. And in the second race for this fleet Lucy MacGregor and Andrew Walsh profited nicely when the breeze went right, they gybe set and were able to rise from second to first which they held across the finish, qualifying the British duo in seventh. “ In reality we are focusing mainly on working up the new boat and polishing how we work together on board. We are in good shape but there are some new teams emerging in recent days. There are the Danish (Norregaard) and even all the Danish team I think are strong. The Argentinian (Santi Lange) has raised his game and as soon as there was a breeze, we see that the New Zealand and Australian team are all right up there "
Racing for the Gold fleet starts 1100hrs Thursday with a forecast for up to 25kts of breeze. Mandy Mulder NED : It was weird. The first race the wind was really up and down and shifting a lot. We came out of it well with a second but are disappointed to get a BFD. The first upwind on the second race it was very windy and for the downwind too. But then the wind dropped and shifted 50 degrees to the right and we had to reach down to the mark. We got a seventh out of that which a struggle but we were happy to get that. La Grande Motte has been quite challenging so for but we are quite happy. We are doing OK. Hopefully the winds will be kind for us in the next days when it counts. Ben Saxton GBR: “It was a tricky day really shifty, quite nice overall but winds were from five knots to 25kts and averaging around ten knots. We had some kite issues on the first lap but came back and did better in the second race. We are doing better today. Yesterday we were happy with our speed but the decision making was not so good. Today was a hard day for the decision making but we did that well. It is good to know we can do it. There is lots of wind forecast for every day but it did not materialise. In the greater scheme of things we seem to be able to put in a result at every event which is nice, but we are a bit disappointed with yesterday. 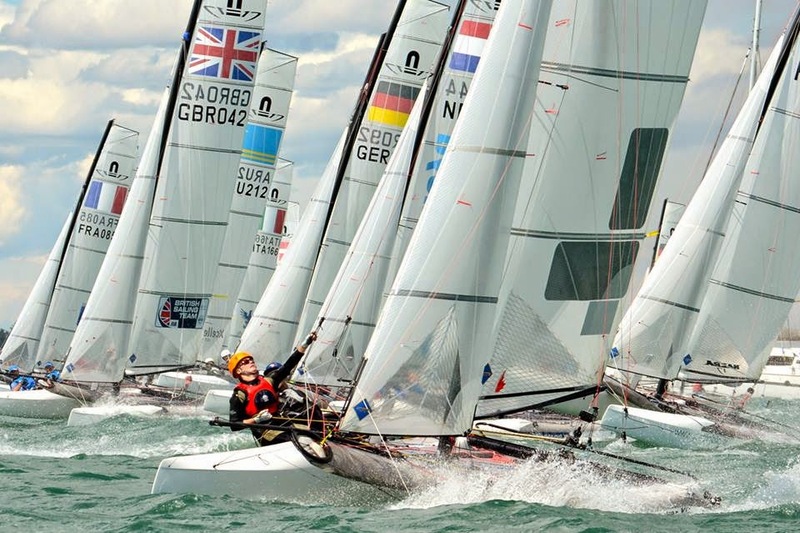 Andrew Walsh GBR: It was a pretty even upwind. The second beat we got to the right and the breeze rotated to the right slightly and that got us up to second. On the last run we were the first to gybe set and that got us straight into the lead. It is good to get a win under the belt. It is set up to be a windy regatta and our boat speed is good. It went light at times, yes, but the rest of the time there was plenty of breeze. Not getting too excited about making changes straight away is good, then picking the best settings just before the start is good, otherwise you can get yourselves into problems. It is such a great fleet, in among these sailing superstars, your Bundocks, Iker and Cammas, and then you have the very good up and coming sailors. It is a brilliant mix and so it is always good to get a win. Billy Besson (FRA) at the top of the standings with Marie Riou: "It's not too bad! It's always good to finish top of qualifying because it all counts. So we have done OK so far even if we are still a bit away from winning the regatta. In reality we are focusing mainly on working up the new boat and polishing how we work together on board. We are in good shape but there are some new teams emerging in recent days. There are Danish (Norregaard) and even all the Danish team I think are strong. The Argentinian (Santi Lange) has raised his game and as soon as there was a breeze, we see that the New Zealand and Australian team are all right up there "